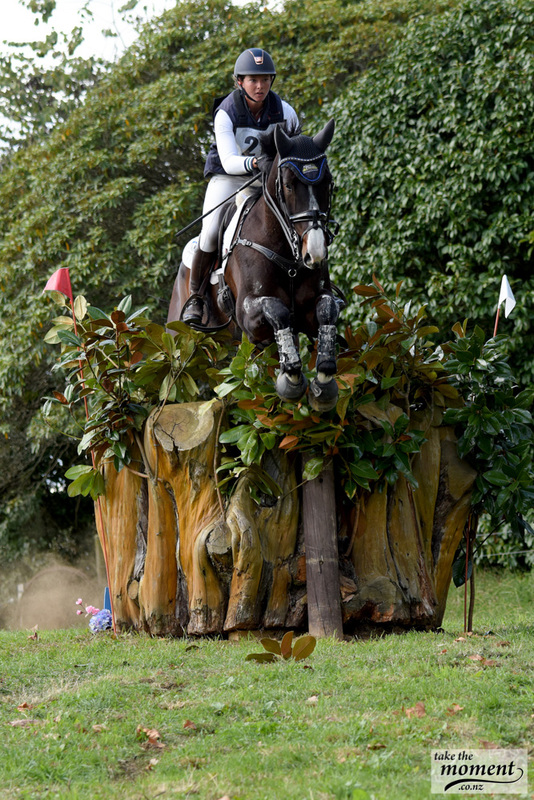 Following the Kihikihi International Horse Trials last weekend where the National Eventing Championships (short format) took place, the winners of the Forest Gate Trophy for the Waipa Home of Champions CCI4*-S title, Samantha Lissington on Ricker Ridge Rui, have extended their lead in the ESNZ Eventing Super League. They held second place after the dressage on a score of 30.9 penalties, taking the narrowest of leads after the cross-country having added 6 time penalties, and showjumped clear in a tense final phase to take the title by 0.3 of a penalty. “That was so exciting!” was her comment afterwards. There are two events left in the year long series, the South Island short format championship at McLeans Island, Christchurch, in three weeks time, followed by the NRM National Three-day Event at Taupo three weeks later. The CCI4*-L at this final event earns bonus points, so things can change dramatically, but Sam and Rui must be favoured to win at this stage. Madison Crowe on Waitangi Pinterest, who were the dressage leaders on 28.8 penalties, had 8.4 time penalties across country allowing Sam and Rui to take top spot, but they kept the pressure on with a clear round in the showjumping to be oh so close runners-up. They leap frog into second place in the Super League ahead of Amanda Pottinger on Just Kidding, who were not competing at Kihikihi. Having won the Eventer of the Year title at the Land Rover HOY, Amanda is saving “Ferg” for the Oceania Championships at Taupo. New Zealand is the current Oceania Champion, having beaten Australia for the first time in a decade at Werribee, Victoria, in 2017. This biennial “test” has been contested in alternate countries since 1985, between the Olympic Games and World Equestrian Games, so the Aussies will be keen to regain the Trans-Tasman Trophy. Monica Oakley and Acrobat, at just their third start at this level, improved from sixth after the dressage to place third overall, while Sam and RR Escada pulled up from eleventh after the dressage to take fourth place. The top four combinations all jumped clears across country, and there was only one other clear round, from Hastings farrier Jake Barham and Atlan. Lucy Turner and Astek Victor were rewarded for making the long trip from Christchurch by taking a slim lead in the Mitavite Young Rider series, so expect to see them again at Taupo endeavouring to hold out the North Islanders. Samantha Lissington (Matangi), Ricker Ridge Rui, 143 pts; Madison Crowe (Hamilton), Waitangi Pinterest, 120 pts; Amanda Pottinger (Havelock Nth), Just Kidding, 92 pts; Donna Edwards-Smith (Te Kauwhata), DSE Cluny,81 pts; Nick Brooks (Cambridge), For Fame, 60 pts; Samantha Lissington, Ricker Ridge Escada, 58 pts.